was Christmas. We slept in a bit. We are trying to savor our last few days of full nights rest before Perry comes. 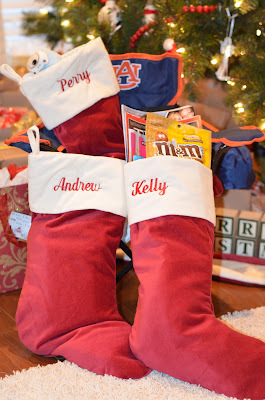 Then we got up to see what Santa had brought us and we had picked out for each other. Our stockings are always full of our favorite things and some random surprises. This is the contents of my stocking. I don't like to admit that I love those unnatural circus peanut candies...but I do. I also got some magazines to read while in the hospital, socks, itunes gift cards and a slinky. Andrew got some candy, oreos, gum, a puzzle pen, amazon gift card, cologne, and some "boogie wipes" to go in his diaper bag. 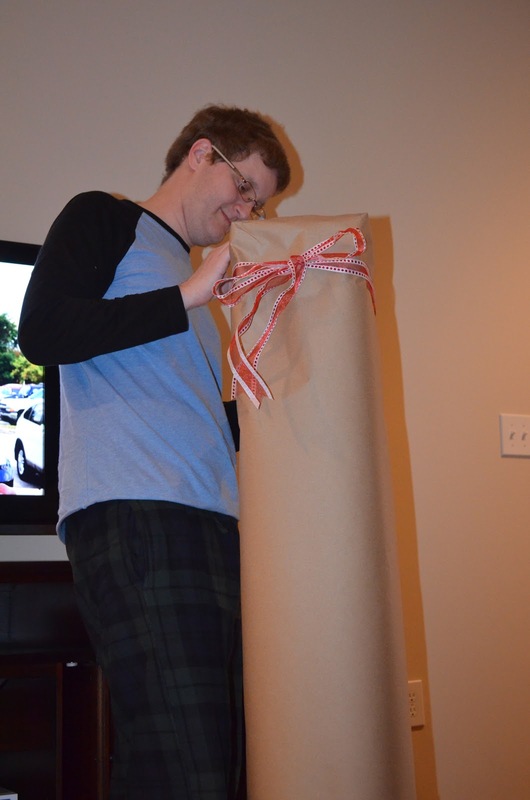 Then we opened the rest of our presents. One of my big presents was a cricut machine. I borrowed a friend's cricut a month or two ago to make christmas present tags and some other craft projects for Perry's nursery and loved it. So excited to have one of my own! 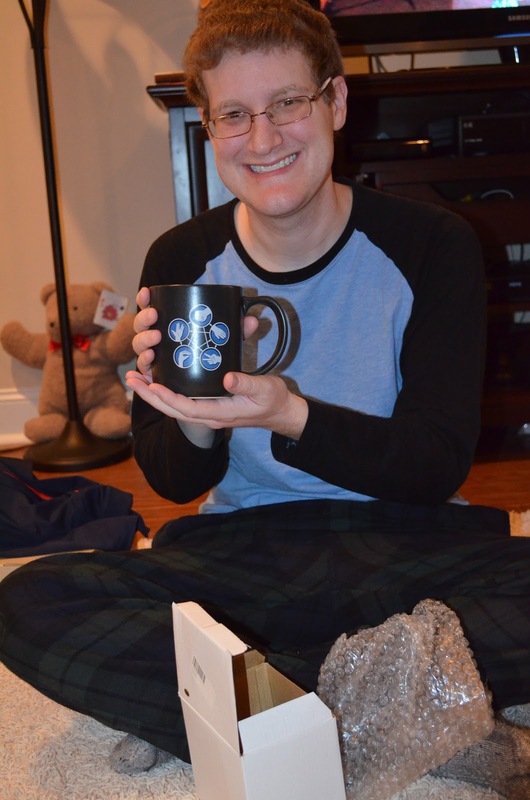 Andrew got a "rock, paper, scissors, lizard, spock" mug. He was excited. One of Andrew's big presents was a tailgate tent. 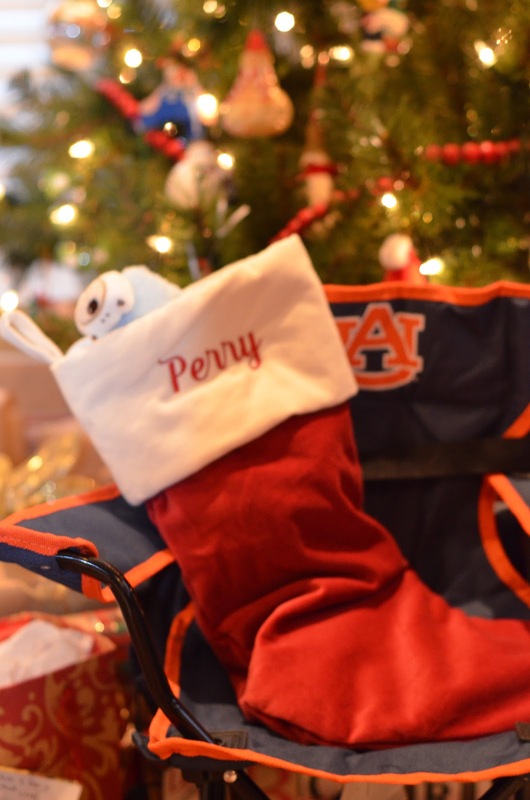 It will come in handy for future Auburn trips as well as hanging out at the beach and in the backyard. That thing was not fun to wrap. He got a soft stacking toy and blocks, slippers, a wooden nativity set, and several other fun things. Last but not least we can't forget Sadie cat...she got some yummy treats and new catnip toys. We stayed home and enjoyed Christmas morning until about 10 when it was time to head off to the next Christmas celebration at Aunt Kay's.